As President George W. Bush contemplates policy alternatives for Iraq, input from experts in Washington has become polarized. Opponents of the Iraq War consider any increase in troop numbers a non-starter and prefer to focus on the modalities for withdrawal. Supporters of the Bush administration seem incapable of framing their latest idea – that of a temporary surge of US troops – as anything other than a repeat of the same old policy, perhaps with some added manpower and resources. Either approach has its problems… Full story here. A Strategy for Dealing with the Sadrists? 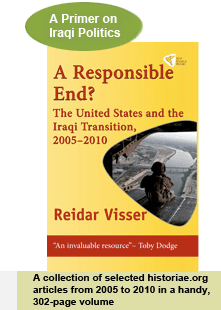 Mark Etherington’s Revolt on the Tigris: The Al-Sadr Uprising and the Governing of Iraq recounts the author’s experiences as chief civilian coalition official in the province of Wasit in Iraq from October 2003 to June 2004. Three features make this book especially interesting: its level-headed consideration of the complexities of post-war reconstruction as a multi-national effort; its unique geographical focus on a peripheral province of Iraq that does not receive much media coverage; and its insightful discussion of the early rise of the Sadrist phenomenon in Iraqi politics… Full story here. Posted in UIA dynamics, US policy in Iraq: Leverage issues | Comments Off on A Strategy for Dealing with the Sadrists? In a remarkable rejection of partitionist winds that have blown through America over the past year, the Iraq Study Group (ISG) in its report of 6 December 2006 recommended a final big push for the Iraqi national reconciliation process, with the collective effort of regional powers as a potential catalyst… Full story here. Among the 25 existing federations of the world, the vast majority belong to one of two categories, or to a combination of these two. Firstly there are “evolutionary” federations – either polities that developed gradually from below by the amalgamation of entities that wished to federate (as in Switzerland), or those built on imperial remnants similarly created over time but which, with a single stroke, were converted into federations, often at independence (like Micronesia). Secondly, there are “designed” federations – political systems whose geographical make-up has been decided by a small group of political elites, often in closed-doors forums of experts on constitutional questions and democratic theory (examples include South Africa and Ethiopia). Only one existing federation has a method for implementing federalism comparable to that of the new Iraq… Full story here.